In 2006, Navien opened an office in the United States in an effort to open markets in both the US and Canada. Navien continues to eagerly provide high quality and innovative products that are environmentally friendly, energy saving, and comfortable. Navien introduced a condensing tankless water heater that offered users extremely high efficiency – up to 98%. Issues did creep into the early Navien systems but those have all been resolved in the newer generation systems. 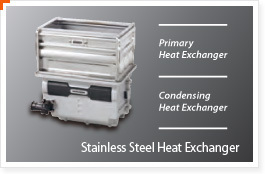 To attain the 98% efficiency rating there needs to be two heat exchangers, one exchanger uses the hot exhaust gases to preheat incoming water and the other finishes the job by heating the warmed water to the users desired temperature. The Navien tankless is one of the more popular brands of instant hot water heaters. Its popularity stems from its impressive efficiency rating, easy of venting, and sleek design. 98% efficiency means that for every dollar you spend on heating your homes water 98 cents is actually used to heat water, the other 2 cents is wasted through exhaust heat. Navien tankless systems also have the option of a recirculation pump and a built in buffer tank, these systems are useful in large homes that have a recirculation system or radiant floor applications.